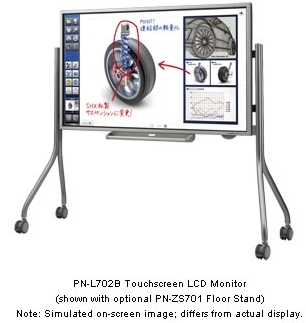 Sharp Corporation will introduce into the Japanese market the PN-L702B/PN-L602B 70/60-inch touchscreen LCD monitors that can be used as electronic whiteboards to display video, still pictures, and PC data with high image quality. These models integrate a large Sharp LCD panel with a high-sensitivity touch screen, and are ideal tools for use in offices and classroom settings. Adopting Sharp’s large 70-inch LCD monitor (PN-L702B), which is 30% larger than its predecessor model, makes the display easily readable even from a distance. And when combined with the bundled touch pen and Sharp’s pen software, the PN-L702B/PN-L602B can be used as an electronic whiteboard. Users can smoothly write or draw directly on the screen, and also conveniently enlarge and reduce the size of the on-screen image and scroll from one page to the next using touchscreen gestures. The LCD panels used in these models incorporate Sharp’s proprietary UV^2A technology and LED backlight technology to deliver high image quality with low power consumption. In addition, connectivity with Sharp MFPs enables paper documents scanned on the MFP to be imported for display directly on the touchscreen. Image data shown on the PN-L702B/PN-L602B, including annotations, can be exported to an MFP for printout exactly as it appears on the screen. These LCD monitors offer solutions to fit a diverse range of usage situations, including connection with multi-screen display systems and media tablets. 1. Touchscreen-integrated LCD monitor incorporates a large 70-inch LCD panel (PN-L702B). 2. Ideal for use as an electronic whiteboard with the bundled touch pen and Sharp Pen Software. 3. Low power consumption and high image quality thanks to Sharp’s proprietary UV^2A technology and LED backlighting. • Dual-touch capability provides functionality to enlarge and shrink on-screen images and scroll pages. model names: PN-ZS701 [for PN-L702B] to be available in September and PN-ZS609 [for PN-L602B] to be available in November.